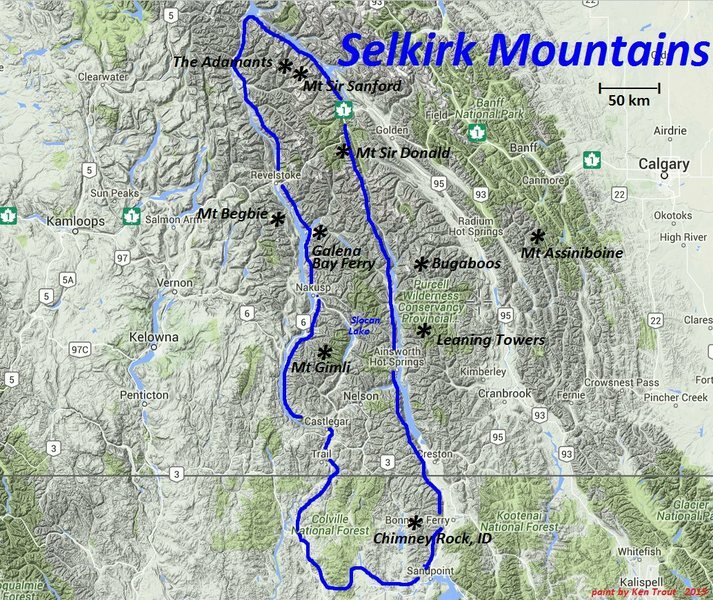 The Selkirk Mountains are hard to discern as a discrete range because they are surrounded by the other big ranges of the Columbia Mountains (blue outline on map). The Rogers Pass transportation corridor, Trans-Canada Highway One and Canadian Pacific Railroad, divides the Selkirks into two halves, the Northern Selkirk Mountains and the Southern Selkirk Mountains. 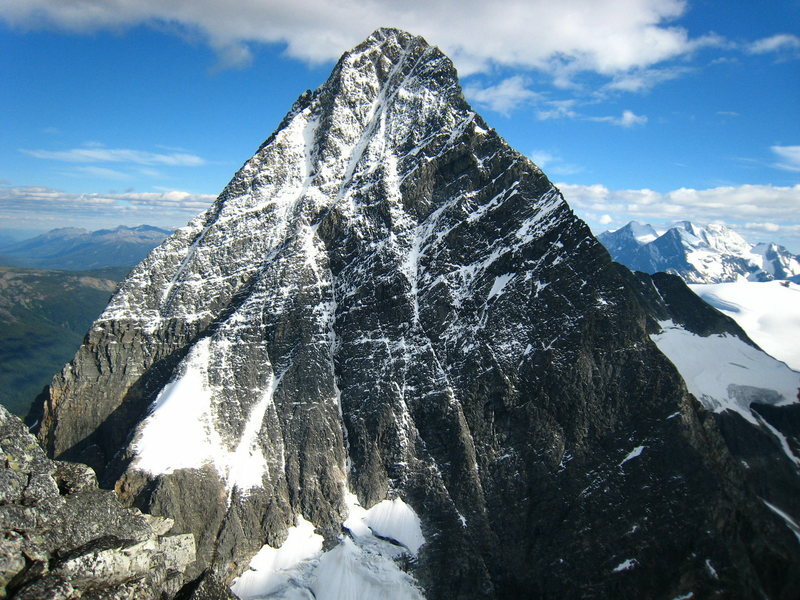 The Selkirk Mountains are the oldest climbing area in the Americas. The first technical climb, using rope and done for sport, was in 1888 when skilled alpinists from Europe made the ascent of Mount Bonney (Chris Jones, Climbing in North America, 1976). Mount Sir Donald was nabbed just two years later by Swiss guides with more advanced rope-work. Other people who climbed regularly for sport soon followed, eager for new terrain as the Golden Age of the Alps ended (Chris Jones, Climbing in North America, 1976). One hundred years ago there were already several guide books to climbing in the Selkirk Range. Today, use Selkirks North and Selkirks South, by Dave Jones, both printed in 2001. For ski mountaineers, and climbers seeking to better educate themselves, there is an important book by Chic Scott: Summits and Icefields . His book covers all levels, from basic information for roadside tele-glades up to advanced details for the great ski traverses of each range. Good beta for most huts and some big peaks too. For rock climbers, the West Kootenay Rock Guide, by Aaron Kristiansen & Vince Hempsall covers all the low altitude crags from the Valhallas south to the border. Find this book for sale at the Valhalla Pure mountain shop in Nelson, British Columbia. The mountains of British Columbia are as complicated as can be. It doesn't help that the boundary between the Selkirk and Purcell ranges is a narrow valley hidden in wilderness and flooded with reservoirs. Even experts get confused and frustrated. 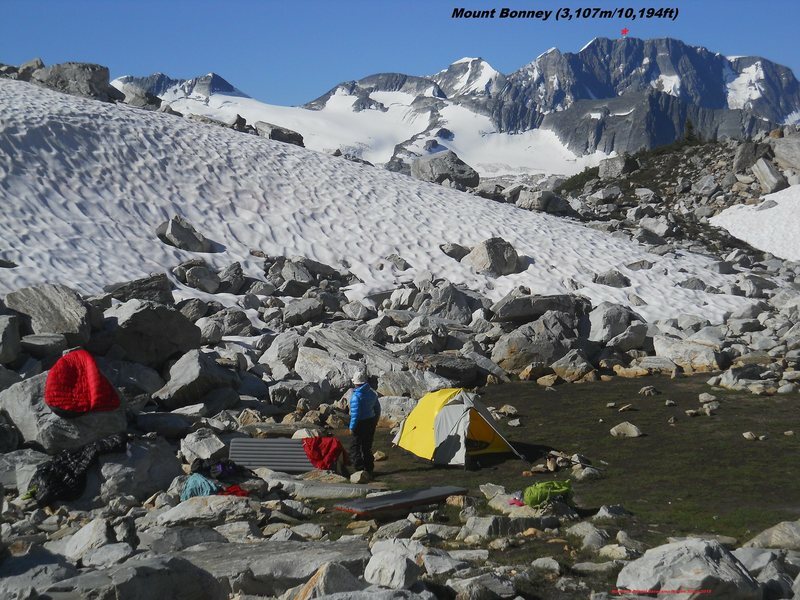 Rock & Ice Magazine once stated that the Bugaboos are part of the Canadian Rockies. When called, the editor at the time refused to believe that the Bugs are not in the Canadian Rockies (not George B!). William Putnam, the real expert, wrote in 1972 that the: "...Geographic Board altered certain of the nomenclature, a continuing practice which has caused vast confusion." And that was before the board dropped the term Interior Ranges and changed to Columbia Mountains (about 1990). Multiple names for mountains, like in the alps, are no problem for climbers who tend to love being well informed. The Canadian Alpine Journal still uses the headings Interior Ranges, Kootenays, and Columbia Mountains interchangeably. Can we do this on Mountain Project? No problemo!